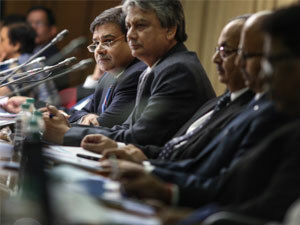 It took six meetings for cracks to become visible within India’s powerful interest rate-setting panel. Following a series of consensus voting and bland statements, there was open dissent on the monetary policy committee in June, which only worsened last week when a member of the Reserve Bank of India’s economic research wing broke ranks for the first time with his bosses, governor Urjit Patel and deputy governor Viral Acharya. The 5-1 vote for a cut isolated career central banker Michael Patra against the relative newcomers on the year-old MPC. “To me that is quite significant,” said Sujan Hajra, Mumbai-based chief economist at Anand Rathi Financial Services, who has been a director at RBI. While debate is good, what stood out is how the members read the inflation model differently, with one wanting to err on the side of caution while others were keen for an inflation-growth trade off, he said. Details on the arguments will be available when minutes are published August 16 and, to be sure, RBI wouldn’t be the only global central bank flummoxed by a slump in inflation. Nevertheless, the split raises questions on how much trust the MPC members place in the monetary authority’s forecasting model, which has consistently overestimated price pressures. The RBI’s inflation assessments have come under intense scrutiny after a slew of readings fell short of projections. Prime minister Narendra Modi’s chief economic adviser Arvind Subramanian criticised forecast errors that he said are “large and systematically one-sided in overstating inflation,” and called on policymakers to take a long, hard look at June’s record-low 1.5 per cent reading. Just three months earlier, Patra had argued for a “pre-emptive” increase in interest rates, though he ended up voting to leave borrowing costs unchanged. Last December, RBI had forecast consumer price inflation of 5 per cent in March with an upside bias, though the actual print was 3.9 per cent, below RBI’s 4 per cent medium-term inflation target. Very few central banks would have made such glaring errors and officials should admit that they were wrong, economist Surjit S Bhalla, a senior India analyst at Observatory Group in New Delhi, wrote in a local daily. The median estimate in a Bloomberg survey of economists published last month pegs this figure at 3.7 per cent. To be fair, most central banks would probably find it tough to factor in the implications of Modi’s unprecedented November decision to void 86 per cent of the nation’s currency as well as the July 1 rollout of a nationwide sales tax. Yet, where RBI’s model is probably flawed is that it is structured around the concept of a small, open economy, according to Rohan Chinchwadkar, assistant professor of finance and accounting at the Indian Institute of Management at Tiruchirapalli in Tamil Nadu. That would be akin to $300 billion Singapore, while India is a $2 trillion behemoth where almost half of gross domestic product (GDP) is generated by an intricate web of unregistered networks that employ more than 90 per cent of workers. An RBI spokeswoman didn’t reply to a text message last week seeking comment. It concluded that forecasting performance is improved by using the Bayesian statistical technique, which assesses the probability of something happening based on observed data. The current model is based on the principles of New-Keynesian economics, which evolved from classical Keynesian economics but differs in terms of how quickly prices and wages adjust. It consists of four variables: the output gap, the Phillips curve that assesses the impact of unemployment, the Taylor rule for short-term interest rates that also guides several global central banks, and interest rate parity through exchange rates. Apart from statistical techniques, inputs of inflation are also crucial. For instance, RBI’s measure of core CPI does not fully strip out fuel costs from its transport basket, which keeps the gauge artificially high, according to Bloomberg Intelligence’s Abhishek Gupta. There are also flaws in the consumption pattern RBI tracks, other economists say. All of which suggest the possibility that RBI – Acharya and Patra’s department, to be precise – may have to return to the drawing board. The debate gains importance as economists increasingly say that lower inflation is becoming entrenched in India.